Abuja — The All Progressives Congress (APC) and the Peoples Democratic Party (PDP) yesterday insisted they both would win Saturday's supplementary election in Benue, Sokoto, Kano, Plateau, Adamawa and Rivers States. In separate statements yesterday the ruling and opposition parties advanced arguments to prove that only a favourable outcome was possible. "In Benue, it is clear that the people have rejected the APC as clearly demonstrated even in the presidential election. Benue State has always been home to the PDP. It is incontestable that our party has the largest genuine followership in all the units, wards and local government areas of the state and as such does not need any underhand measure to secure victory in any election in the state. Our winning lead of 81,000 votes was validly delivered at the polling units and that reality will humiliate the APC, as it cannot be subverted," said PDP's national publicity secretary, Kola Ologbondiyan. But the APC maintained that the opposition is set for humiliation in that state. It said: "Even though the PDP claims a bogus lead of over 81,000 votes, reports strongly establish that this dodgy figure is an aggregate of 'votes' obtained by subterfuge not from the numbers recorded by the card reader. There were cases in Logo, Gwer-West, Vandeikya, Guma, Buruku and Gboko Local Governments where the card reader was not used. 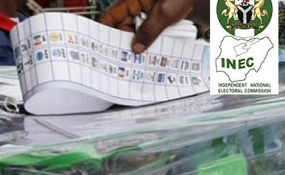 INEC also reported that 41 polling units in Vandeikya did not use the card reader, as it was the case in many in Gwer-West, Gwer-East, Gboko and other places. There is no doubt that our candidate obtained the highest number of legitimate votes obtained with the usage of the card reader," the national publicity secretary, Lanre Issa Onilu, asserted. On Sokoto, the ruling party noted: "Sokoto is a strong APC state. This rubbishes the suspicious and apparently stolen results ascribed to the PDP governorship candidate. It is on record how the PDP candidate and state governor, Aminu Tambuwal, used thugs and fake security agents to scare voters in the state. This gave PDP agents a free and field day to rig and manipulate the governorship election. The forthcoming supplementary election in Sokoto State gives the APC, our governorship candidate, Aliyu Ahmed, and indeed the Sokoto electorate an opportunity to claim our mandate." The PDP however replied: "In Sokoto, the people have given us the mandate. The constitution provides for simple majority of votes. The declared results show that our candidate clearly won and that is why our candidate has been mandated to go to the court to seek interpretation of the section of the constitution that deals with the declaration of results." On the contest for Kano, the PDP claimed: "The people of the state are known to be incorruptible and have always detested leaders who are corrupt and incompetent. They have always elected governors that are acceptable to the ordinary people. The corruption and incompetence of the Ganduje administration is therefore distasteful to the people. And that is why they have collectively rejected the APC and rally with the PDP. All the shenanigans by the APC and compromised INEC officials in Kano will therefore be unachievable." But the APC disagreed, submitting: "The opposition PDP camp, in its self-deceit, has continued to delude itself on its non-existent electoral chance in Nasarawa Local Government Area. The Kano electorate are not deceived. The APC's visible achievements in Kano State under Governor Abdullahi Ganduje are enough to give the party an emphatic victory in the rerun election." PDP described Rivers State as "an impregnable home to the PDP since 1999. The results of all the elections held in Rivers, including the state House of Assembly, showed that the PDP is in control of the state. Moreover, in Rivers, the APC is a vicious interloper, which has been perpetrating violence and killings as a means to subvert and truncate the electoral process since it has no candidate in the election." The APC, on its part, issued a flurry of blame, alleging INEC and Governor Nyesom Wike colluded to rob the party of its chances. It said it was "concerned and deeply troubled by the unfolding events in Rivers State. The APC strongly condemns this horrid dance in the state. This unholy alliance between Governor Nyesom Wike, PDP and INEC is to prevent Rivers people from electing a candidate of their choice by imposing Wike, the PDP candidate, on them. It was glaring that Wike was losing until INEC stepped in to halt the process, apparently to save Wike from impending defeat. INEC must put a halt to this madness and brazen illegality." President Muhammadu Buhari meanwhile will not coax the Independent National Electoral Commission to change results in favour of his political party, the presidency said yesterday. According to a statement by Garba Shehu, Senior Special Assistant on Media and Publicity, "Past presidents of Nigeria were known to interfere in inconclusive elections. That is why party members appear to be upset that the same thing is not happening now. But President Buhari is a different kind of leader." The statement noted that Buhari has sworn to defend the constitution and would not do otherwise. "The constitution of Nigeria gives the president no such powers. It is unfair and ridiculous to criticise President Buhari for not going against the constitution. Party members in states where there will be supplementary elections need to be reminded that they have to work hard to earn their people's votes, rather than expect President Buhari to manipulate INEC in their favour," the statement said. It added: "Interestingly, while members of the ruling All Progressives Congress (APC) party were criticising the president for not interfering on their behalf, members of the opposition were condemning the president based on their assumptions that he would definitely interfere, as many in the opposition did while in power," the statement said. "Under President Buhari, INEC had been and will be completely independent throughout the elections, free from any interference. President Buhari is a man of conviction and the manipulation of election results goes against everything he stands for. INEC is completely in charge." In a related development, a Nigeria-based civil society group has petitioned the United Nations Security Council, asking it to hold Buhari, Chief of Army Staff Tukur Buratai and other key government officials responsible for allegedly rigging the 2019 general elections. The group, 'We The People Of Nigeria', also demanded international pressure on the president and the Federal Government, and outright rejection of the outcome of the elections, claiming they were fraudulent and violated international law and the will of Nigerians. "The Middle Belt people are under siege and are being slaughtered on a daily basis. The forces of President Buhari are using the 2019 presidential election as an excuse to murder the people of Rivers State who are being shot like dogs and slaughtered in their homeland states by federal troops. Several state elections have been declared inconclusive to enable President Buhari to club them into submission," the group said. In a statement by its director and founder, Dr. Lloyd Ukwu, yesterday, the group urged the UN Security Council to place Nigeria on a watch list, pending the outcome of legal challenges to the election. It also called on the chief prosecutor of the International Criminal Court to investigate Buhari, Buratai, INEC Chairman Mahmoud Yakubu, Minister of Transport Rotimi Amaechi, and others over alleged crimes against humanity perpetrated during the elections.